The following allergy free recipes guide will give you ideas on how to adapt the recipes here at Eating With Food Allergies to work for you. Almost all of the recipes here are free of the top 8 allergens but can be adapted to include allergens that you can have. 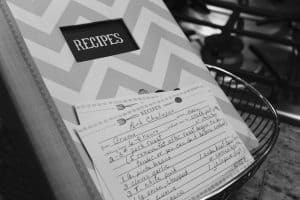 When you’re eating with food allergies, a good collection of allergy free recipes is a necessity because you’ll be cooking and baking from scratch more often. Here you’ll find a collection of recipes that are mostly free of the top 8 allergens. If you are not avoiding all of the top 8, use these tips to adapt recipes for your needs. Can you have wheat/gluten? Simply use wheat flour and omit xanthan gum when it is listed in the ingredients. Not avoiding dairy? Go ahead and use butter in place of margarine and other dairy products when an alternative like rice milk is listed. Don’t need to avoid eggs? Just use an egg in place of flax seed “eggs” or egg replacer. These recipes were adapted from recipes that contain common allergens so they can easily be adapted to include those original ingredients. Don’t be afraid to experiment and see what works best for you and your dietary restrictions! Now, let’s get cooking! Go to the Recipe Index!